So many applications request experience, but how can anyone get experience without getting a job? Most 16-year-old applicants do not have paid work experience, and getting that first job can be intimidating. Here are some tips to consider when trying to get hired as a teenager — or for anyone applying for jobs! Create a resume. More posts on this soon, but there are tons of templates out there to use as a launch points. Resumes should have your contact information, school history, and any extracurricular or community work you have done. As a new worker, you probably won’t have paid work experience on it, but you can list the basketball time, church mission trips, mowing your grandma’s lawn…anything that shows you know how to show up, commit, and work! Another idea: create a Google or Word document that lists everything you’ve been a part of, with dates when you were involved. List awards you have may won and names and contact info of coaches, pastors, and teachers you might ask for a recommendation. Applications ask for a lot of this information, and it’s so helpful to have it in one place to refer to. This is also super helpful for college applications. Where are you going to apply? What are you good at? List strengths you have…are you good with kids? Spanish? Are you organized, strong, creative? Are you good with computers? You definitely want to apply somewhere that you will like the work if you can! Think about places you like to go to. Think outside the box—you can apply to Wal-Mart or the grocery store or fast food restaurants. But there might be an office near your house where you could learn filing skills, or a nonprofit that needs help with their Facebook page. You could also market a babysitting business or lawn care or cleaning. Think church bulletins, local newspapers, Craiglist, or making business cards and knocking on doors for marketing. Look online for jobs: go to a company’s web-site and look for words like “Careers,” “Work Here,” “Employment,” or “Human Resources.” Sometimes they have different names and websites are not standardized, so it can be hard to find immediately. If a location isn’t hiring, consider volunteering there. Oftentimes places like the library or the animal shelter or YMCA offer new jobs to their volunteers first. BONUS: You have material to put on your resume. TRIPLE CHECK EVERYTHING before you submit. If you can create an account and save your application to come back to it later, DO IT. A fresh pair of eyes can catch mistakes your current ones can’t. Create a page somewhere to write down the login information and the date your apply. Sometimes applications are deleted after 30 days, so it’s good to know when you last applied. Get someone else to read your application too. Look nice when you pick up an application (no holes in jeans, button-up shirt is preferable). First impressions are important. A former colleague told me when she worked reception in a nursing home, she would receive applications from people who looked really grungy and unprofessional. She would thank them, then shred the application when they left, so HR never even saw them. I don’t think this was terribly ethical, but it does illustrate the importance of first impressions. Get more than one copy, or make copies. You will make mistakes filling out applications by hand. Don’t turn in one that is folded, crumpled, or has lots of erasings and white out. Don’t turn it in the same time you pick it up. Instead, take it home and have someone else double check it for you. Standing at the desk and filling it out may not communicate planning and organization, and you may mistakes. Submit a resume with the application. It shows you are taking the job seriously, and that you spent more time thinking about applying than the next guy. Dress up when turning in the application too. Say thank you. Treat the reception staff as kindly and politely as you would treat the manager. I’ve had students get hired on the spot when they show up dressed up, with a completed application and a resume. The manager looks at them and sees a put-together teenager who wants the job, who may be better than trying to call 15 other teenagers back and leaving voicemails for kids that never return phone calls. Wait a few business days after submitting the application, but not more than a week. Some places have an application deadline before they make decisions, but most businesses have rolling hiring, so if you don’t hear back they may have already hired someone. If you submitted an application online, show up with a copy of it and your resume. GOAL: Remind them what your name is. Be polite. Show persistence. DRESS NICELY. No holes. No visible tattoos. No facial piercings. Even if it’s for a “grungy” job (like landscaping) or the job requires a uniform, dressing up always communicates you planned and you care. ARRIVE EARLY. At least 10 minutes before you interview. Punctuality is important in new hires. Also, if the guy before you is late, or they are running early, they’ll appreciate it too. DO RESEARCH. Spend some time researching the company’s website. Look at the Human Resources page. Know the basics about what the company does. MANNERS. Make eye contact. Have a firm handshake. Be SUPER polite. NO VISIBLE PHONE. Speak slowly, and it’s okay to take a few seconds of silence to formulate an answer. Many businesses that do a lot of hiring (think fast food or grocery stores) do group interviews or drop-in interview times. This can sometimes be even more intimidating, but focus on being polite and making a good impression on everyone. The people around you may be competitors, or they may be future coworkers! Extra Credit: THANK YOU NOTE. Find out who interviewed you (ask for a business card if you can). Write a thank you note for their time and mail it right away. 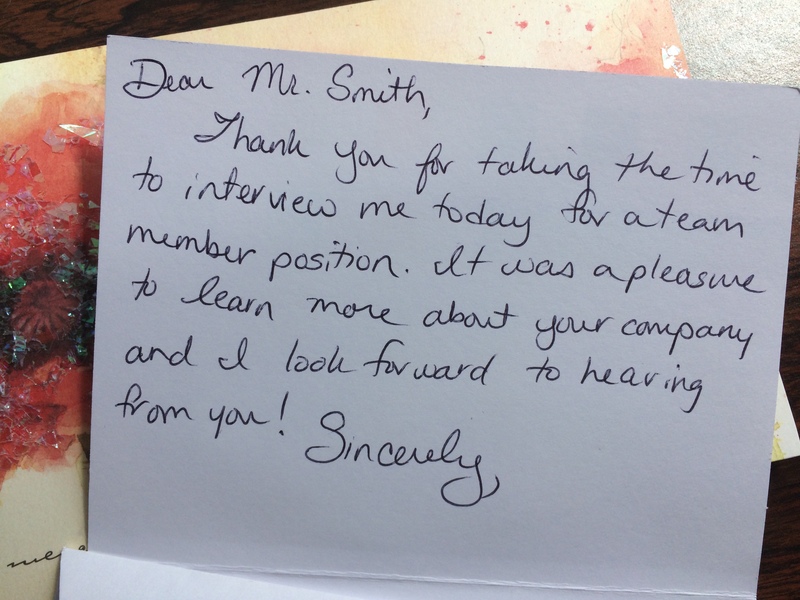 Thank you notes are kind of archaic, so even if you don’t get the job, you can bet it will impress the hiring manager and may even lead to a different, better job later. You can email this as well, but handwriting is extra special. Show the manager that you are the best person for the job. Be mature, poised, professional, and prepared. Demonstrate that you worked hard to get the job because managers want people they can train and who will work there a long time—they don’t want to hire someone new every three weeks. Sell yourself. Sometimes it’s hard to compliment yourself, but on a resume and in a job interview, it’s your responsibility to show how good you are—no one else is going to do it for you. Check out some of the other posts in the Life 101 series, and sign up for updates if you want more hELArious posts in your inbox!